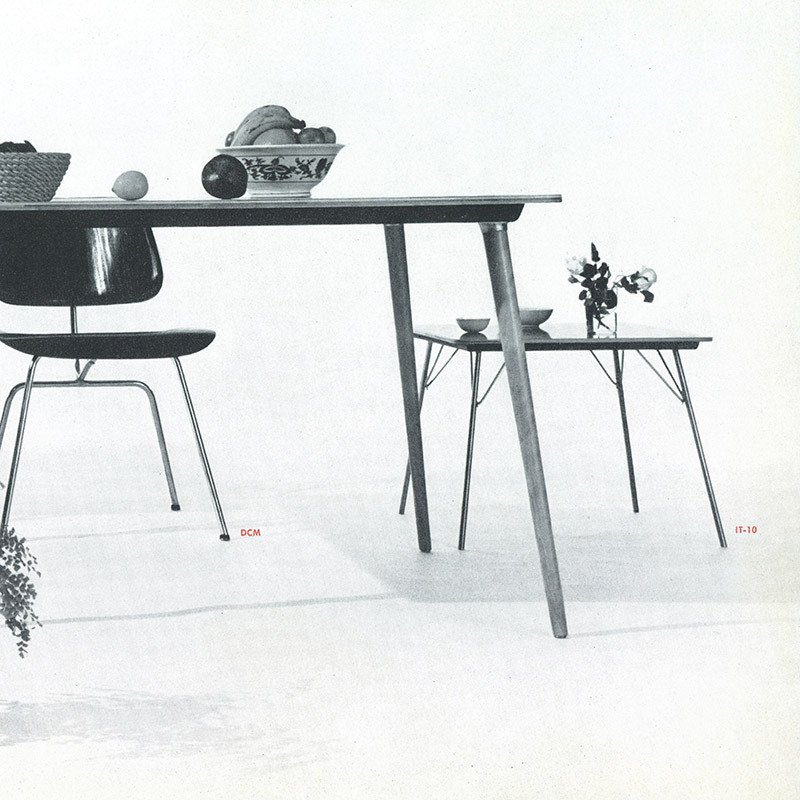 What were the Eames IT Drop Leg Tables? 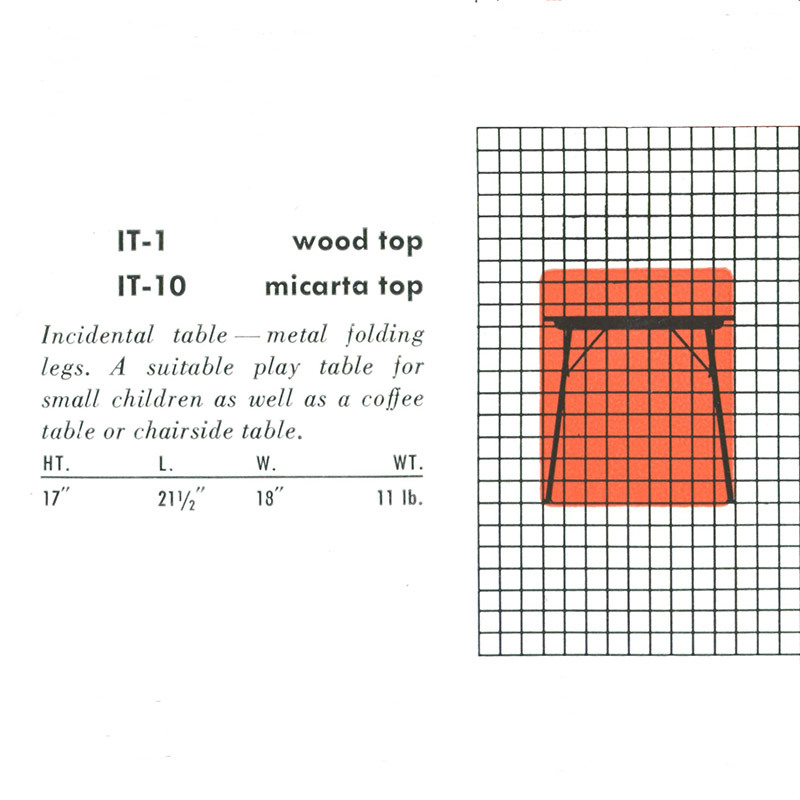 Released to the market in 1947, the abbreviated name stood simply for the Incidental (I) Table (T) and was essentially a miniaturized version of the drop leg DTM dining table. The Eames IT tables were the first side tables produced by the Eames Office for the general furniture market. 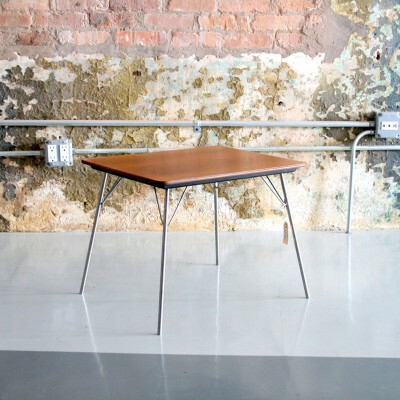 This series of dining (DTM) and side tables (IT) also affectionately coined the name Eames 'Drop Leg' Table due to their ingenious design whereby the legs could fold in sequence inside the underside of the top for easy stowing. 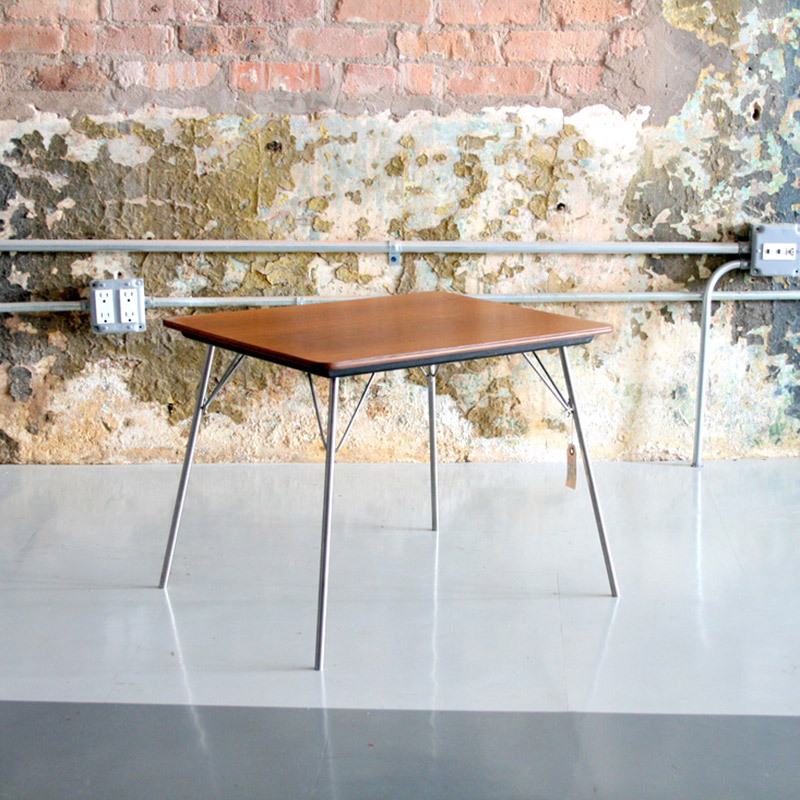 The Eames 'Drop Leg' tables were available in two models, with a natural veneer top in Birch or Walnut (IT-1) or with a plastic coated white Micarta finish (IT-10). 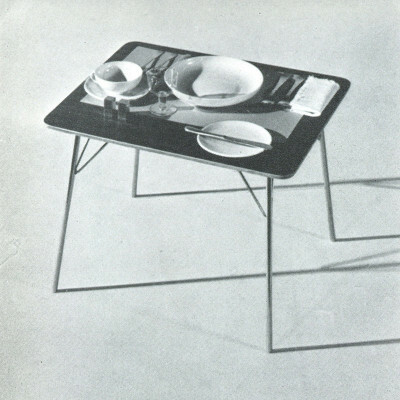 Whereas the larger DTM dining tables were available in two shapes of top, the IT side table had only a rectangular version available. 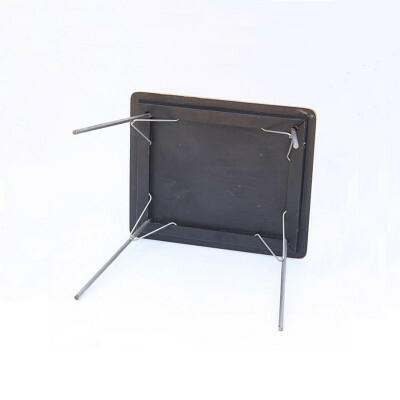 The Eames IT tables were really quite small in size and generally measured only as high as the seat of a chair. It would not however be the smallest table the Eames Office produced with both the Children's Nested Table and LTR both being smaller. 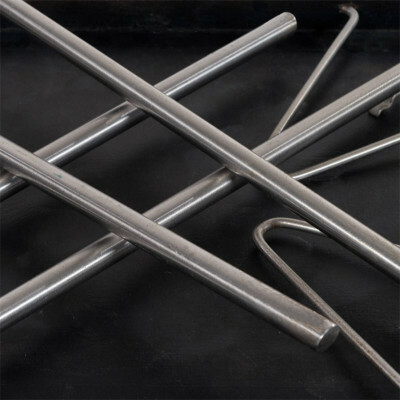 The series was first produced by Kerkmann Manufacturing, from within the Eames Office building in Venice, Los Angeles. Following a period of limited success, Herman Miller bought out the company in 1950 and merged the tables into their already growing portfolio of Eames designs. Whereas the DTM dining tables were sold until 1964, the Eames IT side table was discontinued in 1957 with dwindling sales and the advent of new ranges the most likely reason as to why. 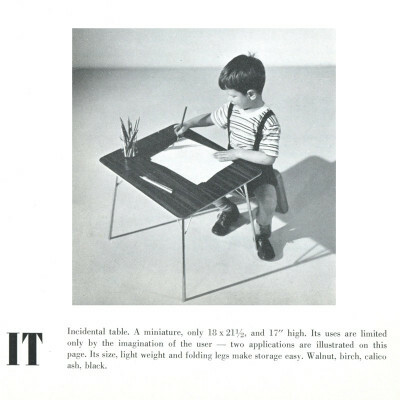 What were the original sizes of the IT drop leg tables? The Eames IT tables originally had push on black feet tips made of plastic in order to protect the floor whereas the original DTM dining tables had fixed feet. The nature of these feet meant that over the years they simply broke or fell off, leaving the majority of IT tables see today without any. 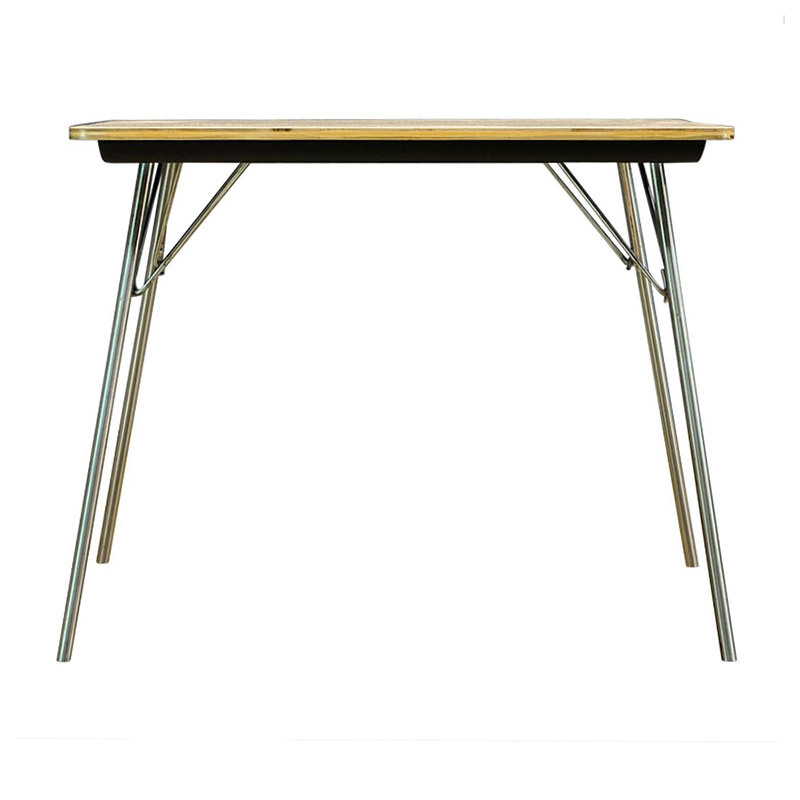 Is my Eames IT drop leg table authentic? What makes it value? 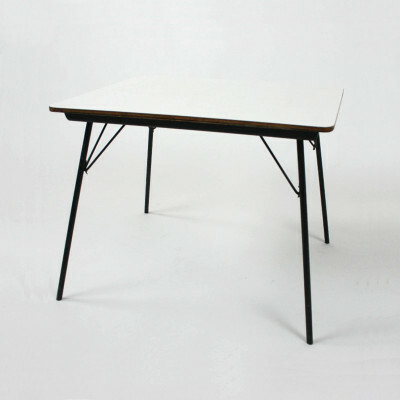 The Eames IT tables were produced by two manufacturers, Kerkmann and subsequently Herman Miller. There are little material or valuation differences between the two. 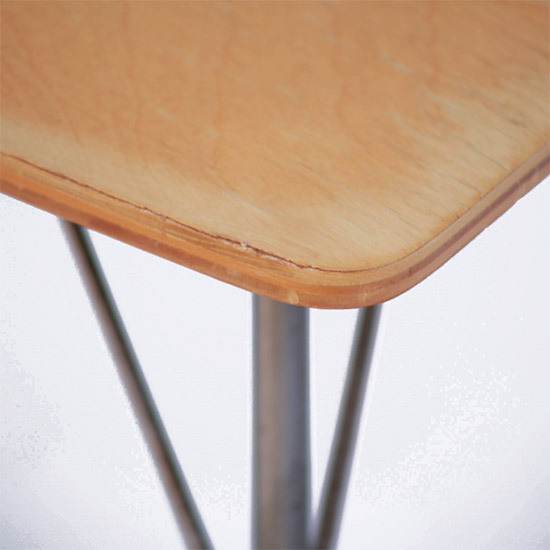 The 1947-1950 Kerkmann tables are likely to have no label as they stamped an impression of the model number along the edge on the underside of the table top. 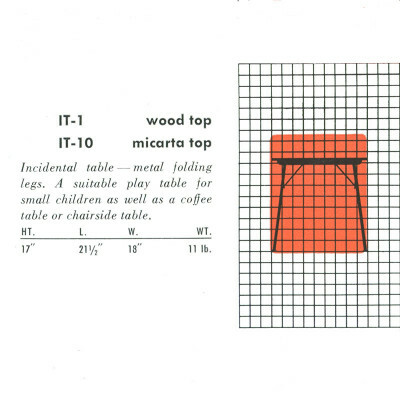 Herman Miller made tables between 1950 and 1957 will have differing labels such as the Foil Strip, Half Label and Silver Disc. Labels and stamps will always provide the best authenticity marks but no known reproductions of the tables exist in any case. With a manufacturing span of 10 years, the IT tables were sold in a number that means they are still found in reasonable numbers in the secondary market. 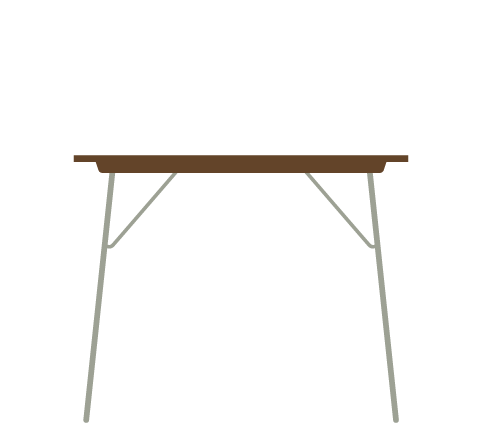 The darker Walnut veneer topped table tends to be the least seen but there is not a significant difference between the three in terms of value . Condition will be the overriding factor of IT table value. Check all around the top, especially the very edges of the top layer of plywood. Check thoroughly for flaking on the top as this will be near on impossible to repair. Chips and dinks will also impair value, especially if they are on the top edge. Nice examples even complete with the push on plastic feet will be the most desirable possible.